The holiday baking inspiration continues today with a little help from The Queen of Cake Pops! We all know her. We all love her. We’ve been reading her blog for years. And following along as she inspires the world to love little bites of cake, rolled up and perched on a stick! Who knew cake pops would become such a phenomenon? I’ll tell you who…. I can hardly believe it but Bakerella is here! 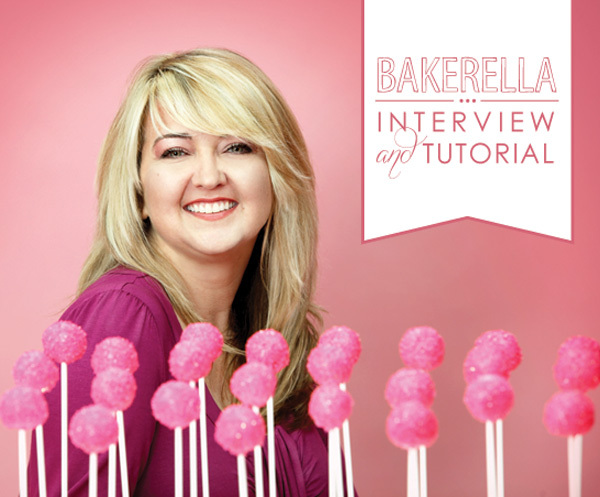 Angie Dudley, also fondly known as Bakerella, is talking cake pops with us! She’s here to share a few tips, tricks and techniques. Spill on a few personal questions. Share about her new Christmas Book. And even has a tutorial for us! Just in time for your holiday baking this weekend! It’s like it’s Christmas around here or something…. So enough with my chatter. You hear from me all the time. Let’s hear from Angie. Everybody loves cake pops! Why do you think they are so popular? Let’s start with – they are just plain cute. Then there’s the initial wow factor and the endless possibilities for themes. Plus they taste yummy. But I think it’s because they bring smiles to everyone that encounters them. Kids go crazy for them, but sometimes I think it’s the grown ups that love them more. Where do you find your inspiration for cake pop designs? Inspiration is all around. Seasons. Holidays. Animals. Colors. And most of all candy. They all play a part. When I start to make a new cake pop design, I usually draw it out on paper and then look for candies the right size and proportion to fit whatever I am trying to create. What are some tips for a newbie cake pop baker? You can bake the cake and let it cool overnight and then dip and decorate the second day. Use small deep bowls for the melted candy coating. It makes it easier to submerge the entire cake pop. Just don’t stir it. Dip and remove. Make sure the cake balls are firm and not frozen when dipping. If they are room temperature, they will fall off the lollipop stick. If they are chilled, they will stay on the stick long enough to dip and dry on the stick. You offer troubleshooting tips in your Christmas Book. What’s the biggest challenge in making cake pops? Definitely the dipping and trying to get the coating to cover the cake ball smoothly. I hope the book helps people see how easy it can be. The book is really a response to the constant flow of questions I’ve received about the pops since I started making them. I tried to address every question that people have asked me. Do you have any advice for food bloggers who are just starting out as to how to grow their blog and gain an audience? Be nice. Constant content. Pretty photos. Then, visit others blogs and interact. I started out on flickr.com and spent a lot of time there in the beginning. It’s a great place to get visible with other people who have the same interests. Join photo groups and link your photos to your website and you’ll start to see your traffic grow. Reese’s Peanut Butter Cups, cold. Dulce de leche gelato. Brown sugar by the spoonful. Do I have to pick just one? What is the one baking tool you can’t live without? I have a mini spatula I use for brownies that I’m in love with. Ice cream scoops for batter are great to get uniform cupcakes. Toothpicks are very handy for cake pop decorating. But if I had to pick one, I guess it would be my KitchenAid mixer. What is your favorite baking/kitchen tip that you’d like to share with our readers? You know, I would just say to not be afraid to make mistakes. Just dive in and have fun. And on that note, I think it’s time for us to just dive in and have fun! Angie is sharing a festive cake pop tutorial from her new book, Cake Pops Christmas. It’s a fabulous collection of winder-themed cake pop projects like Christmas trees, silly snowmen, spicy gingerbread men, candy canes and more. And today we’re going to learn how to make these pretty little present cake pops! STEP 1 : Remove the cake balls from the refrigerator and shape them, one at a time, into small squares to form the shape of a box. You can use wax paper to aid in shaping the sides. Take each side of your cake ball and slide it on a wax paper covered baking sheet. Rotate and repeat for each side to help create a flat surface. In addition, you can use the flat side of a metal cutter to cut off any rounded excess and to help form straight edges. STPE 2 : After shaping, put the shaped cakes in the freezer for about 15 minutes to firm up again for dipping. Once they are firm, transfer them to the refrigerator. Remove a few at a time for dipping, keeping the rest chilled. STEP 3 : Melt the candy coating in a microwave-safe plastic bowl, following the instructions on the package. The coating should be about 3 in (7.5 cm) deep for easier dipping. STEP 4 : One at a time, dip about 1⁄2 in (12 mm) of the lollipop stick into the melted candy coating and insert the stick straight into the bottom of the box shape, pushing it no more than halfway through. Dip the cake pop into the melted coating, and tap off any excess. STEP 5 : While the coating is wet, place two candy heart sprinkles on their sides, with pointed ends facing each other on top of the pop. Leave room to place a mini M&M’s candy in between. Tilt the hearts up to form the shape of a bow before the coating sets. Let dry completely in a Styrofoam block. STEP 6 : Heat the red cocoa butter in the microwave following the directions on the bottle. Pour a little into a small dish. 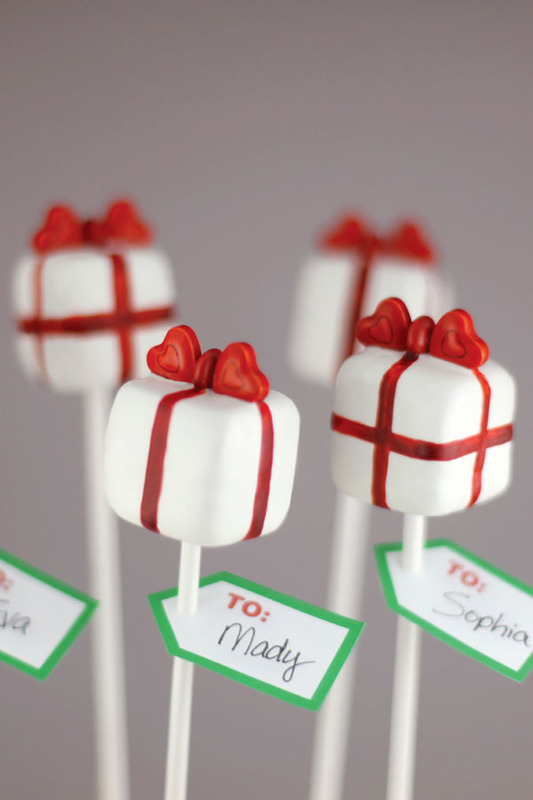 Paint ribbons on sides and tops of the cake pop with a brush. STEP 7 : Let the pops dry in the Styrofoam block. Thank you, thank you to Bakerella for stopping by today! 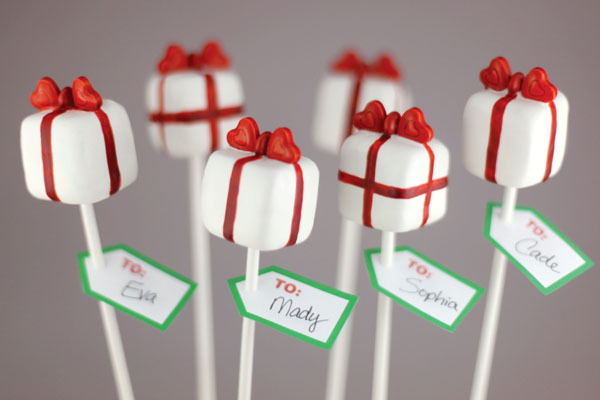 For sharing some secrets and for teaching us how to make these adorable present cake pops! If you still have holiday baking to do, you should definitely check out Angie’s Cake Pops Christmas book for ideas and inspiration. Plus it makes a wonderful last minute gift for your favorite baker. These are so cute. Thanks for sharing. I’ve been wanting to try cake pops for a while now. Maybe I’ll give them a try over the Christmas break. Wow, what an easy way out, I’m so disappointed. Did you not get enough people sending in an actual Christmas cake or are you just going for the big numbers? I used love this blog, but I do not think I will visit again. Jonetta – I’m sorry but I don’t understand your disappoint in a tutorial and interview with one of today’s top baking bloggers. I am honored to feature someone as immensely talented and creative as Angie. And thrilled to share one of her cake pop tutorials. I know many other readers will benefit from her instructions, tips and techniques. If you are searching for the 12th Cake of Christmas… the last and final cake in our holiday cake series…. It was just posted a few moments ago. It’s gorgeous! Please do check it out! Thank you for sharing this! I’ve been wanting to try cake pops and this looks like a great place to start. So cute! Loved the interview! The cake pops are so cute and can easily be made into toppers for a cake. Great interview as well.